What’s the hottest, most happening place in Los Angeles, where you can shop-till-you-drop, and take advantage of a first-class airline lounge – without the airport? It’s the new Citadel Outlets’ VIP lounge that just opened. This high-end outlet shopping center for bargain shoppers now features a special lounge in a luxurious space where shoppers can relax and revive themselves, store their luggage, catch the news, print their boarding passes, use complimentary wireless internet service – and much more. 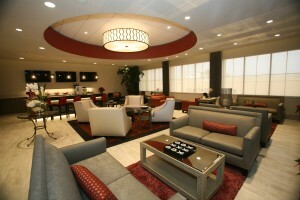 I highly recommend the VIP Lounge to all my “gorgeous globetrotter” readers out there. Citadel Outlets in LA hosts about 20 tour buses daily, filled with savvy shoppers who will likely love all the advantages the VIP lounge offers them. For example, tourists, who arrive from overseas on a morning flight, can enjoy the VIP lounge all day, since most travelers can’t check-into their hotel until the standard 3PM. In addition, travelers who have an evening flight back home to Australia, Canada or New Zealand can check out of their hotel in the morning, spend the day at Citadel Outlets, store their luggage in the VIP Lounge, and take advantage of beautiful bargains. “The VIP lounge is a place to rejuvenate your shopping mojo,” says Traci Markel, Marketing Director. Sounds great, doesn’t it? If you want a FREE guest pass to the VIP lounge, you must be a loyal customer at one of the Citadel Outlets’ stores, and you are eligible to visit with one guest. Just ask your favorite store! Citadel Outlets also partners with a wealth of hotels in LA, so make sure to ask your concierge for a day pass. Otherwise, there’s a charge of $45 for you and $15 for a guest. Citadel Outlets houses more than 120 stores, such as Coach, Michael Kors, Vince Camuto, Ann Taylor, Banana Republic, H&M, Adidas, Juicy Couture, and many more, all offering discounts of 30 to 70% off retail prices. The mall is conveniently located between downtown Los Angeles and Anaheim, on Interstate 5, and is just 30 minutes from Los Angeles International Airport. It just goes to show you that you don’t have to be a celebrity – to be treated like one. Citadel Outlets, with its VIP Lounge, wants to “roll out the red carpet” to all travelers. It’s sure to be a heck of a Bon Voyage.